Several efforts aimed at giving greater impetus to the EU enlargement process in the Western Balkans took place in 2018, but without securing substantive results. Anna Nadibaidze outlines some of the major challenges that remain for the process as the EU seeks to balance its aspirations for influence in the region against concerns over what future enlargement might mean for the EU’s own stability. Last year was supposed to demonstrate a significant revival of EU interest in the Western Balkans, with several key events designed to give new life to the region’s European accession process. Under the Bulgarian presidency of the Council of the European Union, the European Commission revealed its new Enlargement Strategy paper, President Jean-Claude Juncker completed a tour of the region’s capitals, and a top-level EU-Western Balkans Summit took place in Sofia in May. As Austria took over the presidency, Greece and the Former Yugoslav Republic of Macedonia (FYROM) agreed on a deal to change the latter’s name to Republic of North Macedonia – an issue which acted as an obstacle to Macedonia’s EU and NATO accession path. Both Serbia and Montenegro opened new chapters in their negotiation processes, and the EU hosted several ministerial meetings for Serbian and Kosovo officials as part of their normalisation dialogue. Despite these developments, there were also major setbacks in the region last year, many of which remain unresolved. Albania and Macedonia’s accession processes have been delayed by a decision of the 2018 June European Council due to their lack of progress in reforms. 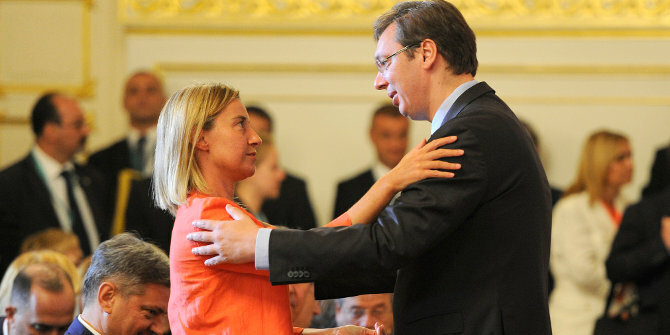 Tensions between Serbia and Kosovo sparked over a controversial border swap deal, the details of which remain unclear, despite EU Foreign Affairs High Representative Federica Moghereni’s efforts at providing a platform for dialogue. The conversation stalled as Pristina imposed 100 per cent tariffs on Serbian goods, despite the EU condemning the move. In December, a decision of the Kosovo parliament to launch a military structure sparked further problems with Belgrade, and attracted warnings from the EU. Romania, which took over the EU presidency in January, is seeking to maintain the region on its agenda. It is understandable why consecutive EU presidencies keep enlargement on their priority list. Enlargement is strategically important for the Union as a whole, because the Western Balkans continue to be crucial for the security of the EU’s borders. Moreover, the slow progress of EU engagement with the region over recent years has encouraged other players, notably Russia, Turkey, and China, to get more involved. Serbia and Montenegro have a historically close relationship with Moscow, as demonstrated by President Vladimir Putin’s visit to Belgrade on 17 January. Feeling threatened by the EU’s enlargement towards its traditional spheres of influence in Eastern Europe, Russia has been showing interest in building stronger connections with the Balkans. Although Moscow’s actual political and economic attractiveness remains limited compared to the EU, Brussels will have more leverage in the region if it is prepared to engage with and respond to these external challenges. The rationale for the Enlargement Strategy and other EU efforts is clear, but whether they have produced the desired results, or whether they will be effective in the near future, is debatable. There is a whole laundry list of challenges in the region, the two main ones being the need for reforms and good neighbourly relations. For Serbia, the major obstacle is normalisation of relations with Kosovo, with the EU expecting to see a legally-binding agreement before Belgrade can finalise its accession. Border disputes remain unresolved, and the EU has been clear that it does not intend to import these conflicts. It already has to deal with tensions between two EU members, Slovenia and Croatia, who are unable to resolve their border issue. Dealing with these problems will likely take many years, which leads to another challenge: accession fatigue. With the process having already taken a prolonged period of time, citizens of many Western Balkan countries are growing increasingly tired of politicians pushing for reforms, while not meeting expectations. In 2018, according to the Balkan Opinion Barometer, 26 per cent of the region’s population believed that accession will never happen, 14 per cent expected accession to be in 2030, 24 per cent said it would happen in 2025, and only 12 per cent said 2020. While these dynamics vary from country to country, rising Euroscepticism should be counted as a challenge. On the European side, member states remain divided on the issue of enlargement, partly because of a concern about the consolidation of EU norms in countries that joined in 2004 and 2007. Recent flashpoints, such as Poland and Romania’s judicial reforms, Bulgaria’s corruption problems, as well as Hungary’s turn towards ‘illiberal democracy’, cast doubt on these countries’ willingness to implement EU laws. This inevitably leads to the fear of further clashes if some Western Balkan countries join the Union too quickly. Public opinion also appears to be divided. A recent Eurobarometer poll shows 43 per cent of the EU public support “further enlargement of the EU to include other countries in future years,” while 45 per cent are against. The support is mostly concentrated in ‘new’ member states from Central and Eastern Europe. Moreover, many EU leaders want to first reform the EU before moving on to enlargement. For instance, French President Emmanuel Macron mentioned that he was not in favour of widening the Union before deep reforms were carried out. Brussels faces the dilemma of accommodating different positions in its enlargement plans. Some form of credible commitment to the Western Balkans is necessary to strengthen the attractiveness of the European model, deal with external influences, and importantly, show the EU’s vitality after Brexit. The UK’s departure will have an impact on the EU’s redefinition of its global role, and engagement with the Western Balkans is one of the ways to demonstrate Brussels’ willingness to remain a relevant actor. At the same time, as it cannot push the process too quickly given many member states’ reservations, the Commission’s approach seems to be to keep the Western Balkans in a state of limbo, where the EU confirms the European perspective of the region, but where accession developments are based on merit and any time frames remain indicative. Enlargement policy remains a powerful mechanism in the EU’s foreign policy toolbox. It allows the bloc to have considerable leverage over its neighbourhood if the prospect of joining is credible. As seen with the recent efforts, the EU is aware of the Western Balkans’ importance and tries to make use of its tools to address regional concerns, mostly over security. But progress is being held back by problems in the region, and by internal EU disputes and fears of admitting more unstable countries into the club. Given these obstacles, the Commission will have to limit itself to statements and summits without making any firm promises, and continue engaging with the region, but without securing substantive results. Anna Nadibaidze is a research and communications associate at the think tank Open Europe. She holds an MSc in International Relations from the London School of Economics.